What?! At the Slavery Footprint web site you’ll learn two things. First is the startling news that there are 27 million slaves in the world (an estimate, obviously), many of whom sustain the supply chains of everyday goods we own and use — the children, for example, who pick the cotton for our clothes and mine the raw materials from which our phones and computers are made. Second is that the web site, created by MUH-TAY-ZIK | HOF-FER, is brilliantly conceived and designed, which easily explains its powerful reach. Simple icons and childlike colors respond to your touch, moving to and fro, in and out, teaching you about modern slavery and calculating your “footprint.” I especially like it on the iPad, where I first saw it.It’s a remarkable cause made more remarkable by its design. It’s fresh thinking, not just repurposed print, and a persuasive use of new media. We’ll be seeing more of this. Also from MUH-TAY-ZIK | HOF-FER is the similarly impressive Ekso Bionics site, which is another tight marriage of design and story. Here’s the thing. For the designer, the story is where the money is. It’s the value that you bring. In many cases, the client/boss/ committee hasn’t fully articulated the story. This is normal. Your essential work is to get in there, collaborate, facilitate, bring it into the light, then bring your creative vision to bear on it. Only once you have the story will you have something to design. And only when the story is told will the client have something worth paying for. Together you can move mountains. It’s not only that it’s value added. It’s a gift you have, and a responsibility — that of making visible what others can only think or imagine. It’s what sets you, a designer, apart from the masses of low-budget, crowd-sourced decorators. 20 Responses to How many slaves work for you? Outstanding article by you John. But amazing websites. And amazing messages on both. This designer truly gets the simple is better rule. I can only pray that my design and all that I have to view were this clean. The animation is amazing, but it’s the way that nothing gets in the way of the message that makes these sites incredible. Thanks so much for pointing them out. Do you have a Pinterest board? I would love to follow you to see what you pin. Thank you for sharing these two examples. Really beautifully prepared! Making people want to read your words is at the heart of good design. Anything and everything a designer does that makes a brain decide NOT to read is, therefore, not good design. Regardless of how well he/she uses color or any other element. I find that good websites are highly readable. Your street cred for pulling stories out of the banal, everyday has been forever cemented in my mind with this video: http://www.youtube.com/watch?v=BIJ0NBHdRsI “The sidewalk has a story.” Who would ever think that? A really kickbutt designer, that’s who. Be that guy and clients will beat themselves up to get to your door. Really, really incredible design and storytelling. It made me stop, click and scroll. 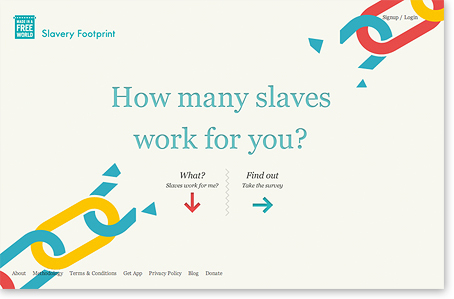 Does the “slaveryfootprint” site design insulate me to a certain extent from anger? It is like a clean, modern, young fashion site. Nothing in it connects emotionally to the plight of young children toiling in factories. That should be a major part of the motivation and message. We don’t do anything unless moved by a need or emotion, and the fact that there are slaves, and children slaves in today’s world, should make us angry enough to do something. Slavery is egregious, but my sense is that the remedy begins with engagement, not anger. You basically have an invisible problem — slaves in the supply chain — that needs to be made visible, which the site does beautifully, without accusation. So no defenses go up. Once visible, action can be taken. The idea is that manufacturers are unaware of the slaves in their supply chains and, having been made aware, can take steps to change, hastened by newly enlightened individuals like you and me. “So no defenses go up.” I think you are accurate that the slaveryfootprint site must not clutter itself trying to elicit emotion. John, you are gifted and skilled at simplifying the complex and clarifying the simple. Thank you for showing us how to do the same. As I see your words, I have to agree totally. That’s the reason I love this site: the beauty is shown in design, in ideas, in thought, across all boundaries. I think that was the coolest website I’ve ever looked at. Clever. Inspiring. Simple design. All the things I aim for. While I’m totally sympathetic to what they’re trying to do, it’s a pity they created a site that won’t work in Internet Explorer. It’s trendy to diss IE, but it’s still the dominant browser, and a lot of people are being shut out unnecessarily. Also, their page informing me of this fact felt condescending and judgmental. I call it a fail. Note: wasn’t able to access the website using IE — asks for Firefox, Chrome, or Safari. It doesn’t work in Firefox either if you have any security at all (e.g. NoScript http://noscript.net). I didn’t get as far as the intrusive questions Martha mentioned; even ‘About’ at the bottom of the page does nothing, so I can’t even get clues about who runs the site or why. I doubt very much whether the designer gave any thought at all to people with older browsers (visually-impaired people are often cited as likely to have years-old, text-to-speech equipment with antediluvian software embedded in it) — or maybe they just dismissed them as an insignificant minority. So, without getting into a long rant about careless or lazy or arrogant web site design & programming . . . it’s a big ‘Fail’ for me, too. Given the depth of creativity manifested by this site, I think it’s unlikely that the designers were either careless or arrogant or “dismissive” of a minority (although, of course, I don’t actually know). Our world is evolving fast, and it goes without saying that at some point things get left behind. In this case, accommodating old browsers would probably have made the remarkable presentation impossible. Could they have made a second, static site that’s friendly to every browser, old equipment, the visually impaired, and dozens, even hundreds, of security devices? Maybe. But my guess is that business-wise, the numbers wouldn’t add. As for the About page, here’s what’s on it . . .
Based in Oakland, California, the Slavery Footprint team works to engage individuals, groups, and businesses to build awareness for and create deployable action against forced labor, human trafficking, and modern day slavery. In addition to creating and developing the online tools, the organization is also engaged in off-line community education and mobilization programs. Site and App developed by Us, MUH-TAY-ZIK | HOF-FER and Unit 9. Thanks for your response, John, which now has me intrigued enough to go off and find an insecure PC that I can view this web site on. I do actually want to see this “remarkable presentation.” Without wanting to seem creepy, if you think it’s remarkable, it must be something special. But will such people actually notice or appreciate the design qualities of the site? Are we getting into “pearls-before-swine” territory? We’re getting skinnier and skinnier! I see that I need a new format for Design Talk! Your comment, “Will such people actually notice or appreciate the design qualities of the site?” stands out. The design is great specifically because it facilitates the message. It requires no “appreciation” — it just IS what it does. That’s what design is. It’s not a decorative add-on. It’s really refreshing to see a site that has actually thought of relating to people from different countries (realistically, nobody who isn’t Steve Irwin ever says “crikey,” but it made me smile!) rather than the usual assumption that everybody on the internet is American. Most other sites would have boldly informed me that the number of slaves is equal to the population of Texas (or something else that means nothing to me since I have no idea what the population of Texas is.) They got my attention straight away. Privacy alert! The slavery website wanted way too much detailed information. I understand what they’re trying to do, but there should have been way more and credible privacy assurances up front. Even then, I doubt I would have given all the info they requested. It was creepy — them wanting to know all about my children and size of my house and where we live. Almost as if they were looking for children to enslave instead of the other way around. No way am I giving my phone info. Gen Y is way too trusting. I also had a hard time finding what to click on next. I almost didn’t notice the little blurbs with the facts on each page. I realize I am old-school (mid-40s, bifocals), but we’re the ones with the money to support these causes, and I am increasingly more frustrated in my Internet forays. I admit it was a beautiful site, but functionality is key. The sites are pretty snazzy with their playful graphics and technology and can be entertaining. But as a reader, the fancy technical tactics are distracting and cumbersome. In the slavery site, the moving arms and moving text break up my reading flow and cause me to work for the next paragraph. 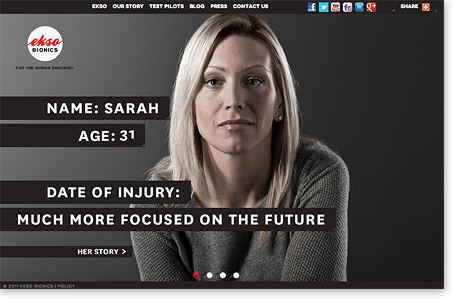 With the bionics site, the graphics move faster than I can comfortably muse over the content. Thus, if the story is the foundation of the design, then why am I being distracted from the story? The sites may have grabbed my attention, but they failed to retain my attention. Perhaps if the graphics were a little less animated, I might find them to be more successful. I find the calculations a bit careless. If you do the detailed questions you’ll find that the assumptions are often wrong. And it’s not obvious that you actually need to do the detailed questionnaire to get accurate results. But even if you take that into account, I doubt that the results are really accurate. My results are higher than average according to the site, although I don’t have a car (I only take public transit and walk) and try to buy local or fair-trade food, for example. Good initiative and very impressive design, but the numbers feel off, and if the numbers are off I doubt that the results will be very compelling.